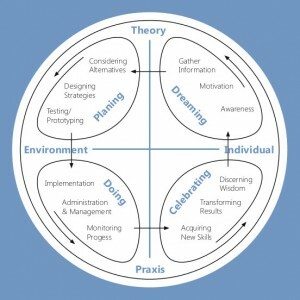 The Dragon Dreaming design process has at its foundation the interplay between the individual and the collective and, theory and practice. John Croft has related it to ecological processes (water cycle, seasons, etc), human processes (life phases, characters, etc) and indigenous traditions (Native American Medicine Wheel, etc) as well as other social and environmental theories (Macy, Bateson, Ganhi, June, Campbell, Scott-Peck, Rosenberg and Tuckman). 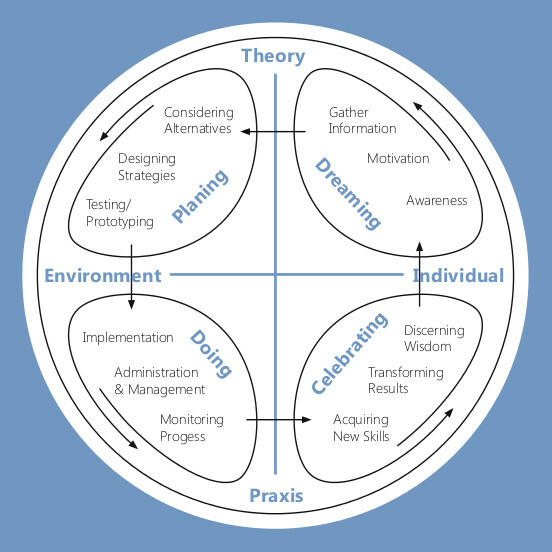 The four stages – dreaming, planning, doing and celebrating – are not rigidly separated and are fractal in nature as each stage involves the four stages within itself: in dreaming, you begin with awareness, move to motivation, and then information gathering before crossing the threshold through celebration to the planning stage, again with its own stages. Dragon Dreaming uses certain design tools, listed here and used in this design. For more detail, go to the design pages on this website and see also the e-book. Permaculture design uses processes and tools from many different sources to carry out a design process. It is the testing of a design proposal against permaculture ethics and permaculture principles that makes a design a permaculture design. There are also key permaculture design tools to check a situation or design against ecosystem principles, such as input-output analysis, zoning, sectors, slope, web of connections. The Dragon Dreaming design process and tools can meet the ethics and principles and offer useful tools to permaculture design.